On Saturday 5th of October 2013 a Mini Festival was held in partnership with Dikkumbura Sri Siddhartha MV and local education authorities. This event aimed to bring children from neighboring schools together to enjoy a range of workshops run by local and international artists and practitioners and organisations. This event was made possible thanks to a donation by Dikkumbura Sri Siddhartha MV’s partner school in the UK, King’s College School, Cambridge. 361 students participated in this event with each child having the chance to learn something new during interactive and dynamic workshops. Each student participated in 3 workshops and were also very proud to perform their new talents. 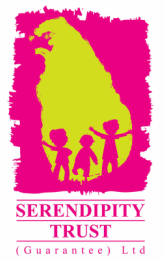 This Galle Children’s 'Mini' Festival offered 18 different workshops (3 sessions of each workshop) for 6 schools. Students worked with Shiroma from the British Council Library to create amazing illustrations. Students participated in an interactive Story Telling Session with Shiroma from the British Council’s Library. They each then made their own bookmark to take home. Students learnt the importance of protecting our oceans by not littering and recycling their waste products. This informative session was followed by a fun art activity. Nifraz promotes a strong reading culture amongst school children as a lifelong habit. In this session Nifraz read a chapter from a Sinhala and English story with the children. They then made bookmarks. Children were taught to design a creative piece of work using paper while singing. The purpose of the workshop was to encourage students to enjoy whatever they do and make things fun and enjoyable. All children had the chance to learn some new drama skills and dance steps to different types of rhythms. This workshop promoted the integration of children of all abilities. Sebastian shared a variety of colourful children’s books before encouraging students to create their own illustration of a village perahera.